Rating abuse - downvoting a post or comment for personal resons or beliefs, that don't relate to the actual subject of your rating. - This is what you will get banned for. If you believe you've been unfairly treated by moderator, please report cases of abuse to SAiNT. Fresh Releases - where you can track releases not older than 2 weeks, or those that weren't published anywhere yet. Archive - everything else, including RePosts. Don't know how to download? - Read this article. Keep in mind that after 90 days of inactivity (since last login) your account will be automatically removed. Comments are open to discuss the release, not to make pointless statements, post requests or ask for new links. You will be freezed from comments for this violation. You can subscribe to comments to receive follow-ups when new comment is posted, you can also reset your subscriptions in your user profile. You can post mirrors in comments, unless you see the notification that Uploader requested not to post mirrors. We allow all protocols (http, torrent etc. ), as long as the file doesn't violate our rules (no ads, no spam in archives). If you believe you've been unfairly downrated, read this post. 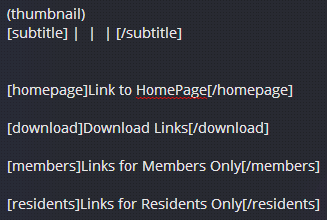 You don't need to post "dead links" comments, because now we have a special group (Residents) that can directly send Reupload Request to the Uploader and Cleaners. However, if you spotted dead post, the best you can do as a Member is to contact the author of that post via PM and request new links. In general, after a Resident makes report, uploader has 24 hours to reupload links; if he doesn't, next report will be sent to our Cleaner. As a Member you can speed up this process by contacting our Cleaner directly, but please understand that he receives thousands requests every day, so only contact him when other options failed. Cleaner - Does reuploads, mirrors and cleans AudioZ from older posts. Releaser - Releaser is an uploader or team that makes their own releases. This group also have their own blogs at AudioZ. Supplier - Someone who supplied stuff to releasers. Resident - Group of members with some special abilities. This group is also responsible for reporting dead links in posts and other issues of importance to the forums. 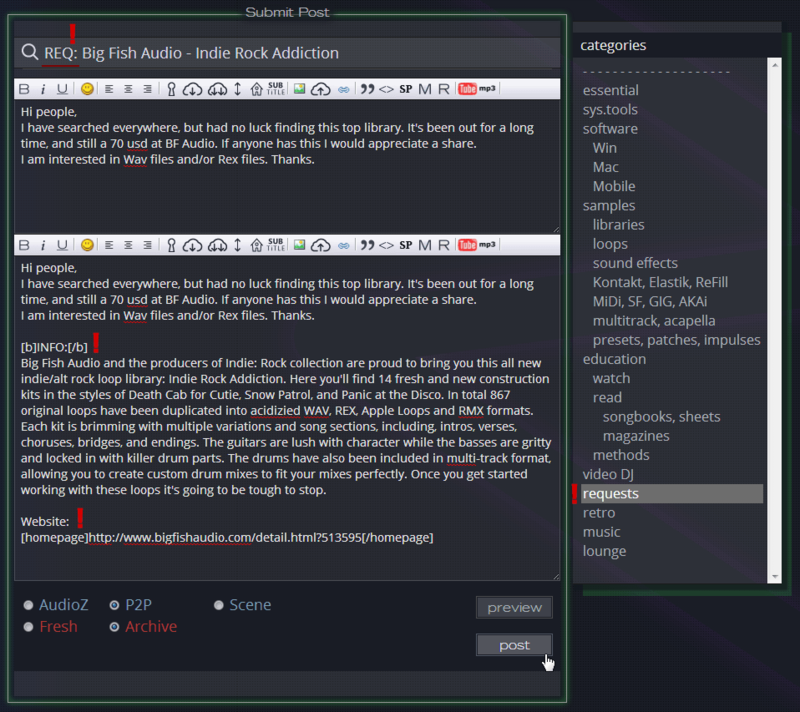 At AudioZ, we have to check and moderate around 40 posts daily. It is only up to you whether your post will be published or declined. We have very strict requirements and some specifics that you'll never meet unless you read these rules. If you don't, your post will be removed without any notice. Search. Always make sure you search before submitting new post. Double-Posts are not allowed! However, we do allow "Proper" releases if the reason for a Proper is described; We also allow releases with different authentication methods (crack/keygen/serial etc.). No spam, advertisement or links to other related web-sites inside archives, or anywhere on AudioZ. All download links must be posted through PeepLink. Posts with CAPITALIZED titles will not be processed. Select "Fresh" only if you're 100% sure you're posting recently released software, or if it wasn't released anywhere yet. Do not use different colors, fonts, alignments or other unnecessary tags to pimp your post. "ALL in ONE" home-made "Plugin Collections" dump packs are prohibited. We have 2 primary File Storage Services, as decided by our members. Every post must at least contain links to UL and RG. However, you can replace one of them with "free" services like MEGA. All links must be available for free download without a premium account! Pre-Posts are not allowed. You can only submit your post when you have release uploaded and post completely prepared. Partial uploads are not accepted! If you ever make post with incomplete files, missing description or any other details, your post will be forwarded to another uploader. You are allowed to post links to your FFS (Free File Storage) referrals. You are not allowed to post links to your FFS folders collections. You can post mirrors in comments to other uploaders posts, unless it is not allowed by the uploader. Reserving comment space, clearing your comment and posting it again to take a higher place or cheating in any way will result in immediate ban. It's prohibited to register multiple accounts to double-post mirrors or freeware content. Only release teams are allowed to operate under multiple accounts. We prohibit repacking releases made by teams. If you're posting new version of a software with working keygen or crack from older release, team that made the original release must be specified in the title. You also must make it clear that release is not official. It is also prohibited to repack Team's R2R releases or use parts of their work in your own releases. Pictures in Short Post must be placed in "thumb" tags, otherwise not overexceed 350x350px. Always indicate software's platform in the title or [subtitle] tag (x86/x64). Torrent links can be added as mirror, but only as a magnet link. Here you can view an example of a properly prepared post. 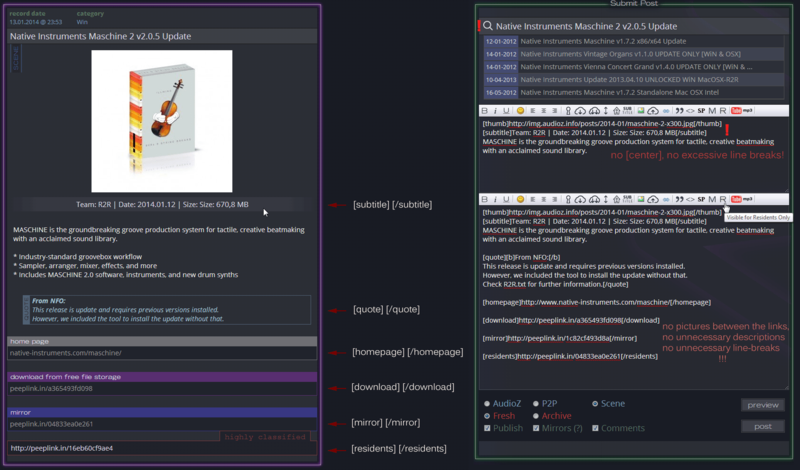 - as you can see, every tag has a tooltip which will help you get used to it. 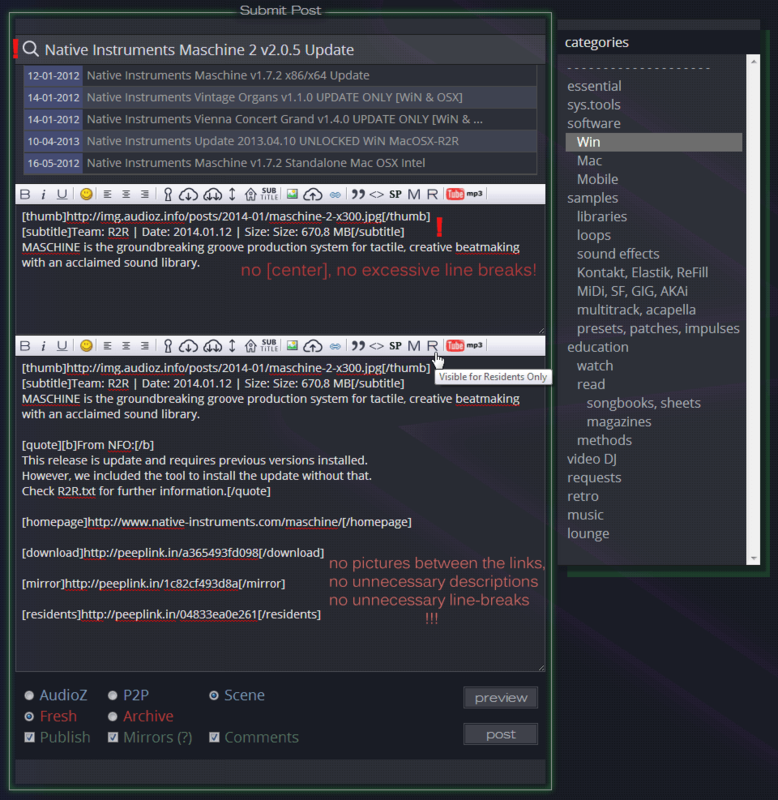 and this is how it looks in the editor and on the site. If you're posting an exclusive release and willing to guarantee fresh link reuploads within 24 hours after Reupload Request, you have the right to ask not to post mirrors in comments; this is done by unchecking the "Mirrors" checkbox on Submit Post page. be as much specific as possible, try not to use multiple categories. essential - for administration use only. sys.tools - for administration use only. samples - if you're not sure what you have, just select Samples. libraries - libraries are those that contain different material (loops, samples, patches in one). methods - this is for courses like "Guitar Methods", "Play Along.." - those should be posted in this section. video DJ - everything related to VJ's. VJ and Video Editing are not the same! requests - people may ask for ReUPs, so if you want to upload more, you may want to check this section daily. Site News - for administration use only. Industry News - announces and news related to Audio Software Industry. Music - for administration use only. While posting into SubCategory, you don't need to select the Category itself. So if you're posting in the Sound Effects category, you don't need to select Samples and Sound Effects - only Sound Effects. To submit a request, you need to be sure it wasn't posted or requested before. Use search, and then also search with DuckDuckGo. Go to Submit Post page, select requests category, put "REQ: " prefix in the title and provide maximum information about the software you're requesting. Please do not request something that's only been released recently or announced. Also, don't request reuploads - if you found a dead post, the best you can do as a Member is to contact the author of that post via PM and request new links. Improperly prepared request-posts will be removed without any notice.